On 22nd May 1973 Her Majesty the Queen opened Charing Cross Hospital. In what is an encouraging incidence of serendipity, the local elections that will decide its future will take place 41 years later to the day on Thursday 22nd May 2014. May 22nd is Save Charing Cross Hospital Day. H&F’s Conservative councillors are more than a little rattled by this. They have come in for some acute criticism from residents – many of them usual Conservative voters who have switched to us for this critical election. Other Councils have used their legal and planning powers to save their local hospitals. But H&F Conservatives voted to support the demolition of Charing Cross Hospital and to sell off the majority of the site. They propose to leave the Borough with what will mostly be a GP-led clinic, just 13% of the size of our hospital. You can read more about that here. I guess H&F’s Conservative councillors calculated that if they spent enough council funds on propaganda they could fool most of the people most of the time. They couldn't. 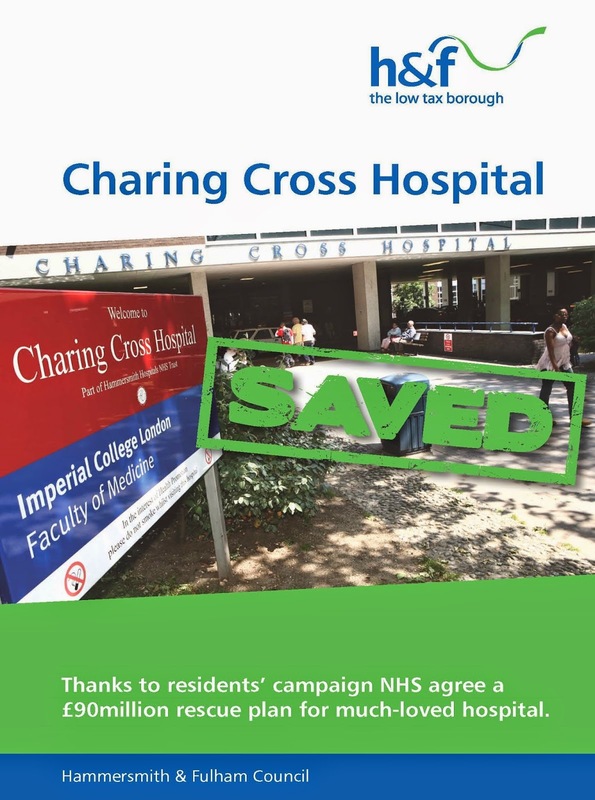 It’s now fifteen months since they left the residents-led, cross-party campaign to Save Our Hospitals and put out the first of many tax-payer funded council leaflets falsely telling residents they had “saved” Charing Cross Hospital. So how do they explain all that to voters now? Surprisingly, at the Fulham Society hustings on Wednesday night Council Leader Nick Botterill (Con) took the unusual approach of publicly questioning whether this attached leaflet (I brought a copy with me) was anything to do with him or H&F Council. That was ill-judged considering he spent £20,000.00 of public money posting it to every household in the Borough and many in the audience remembered getting it. That approach is clearly not going to work. 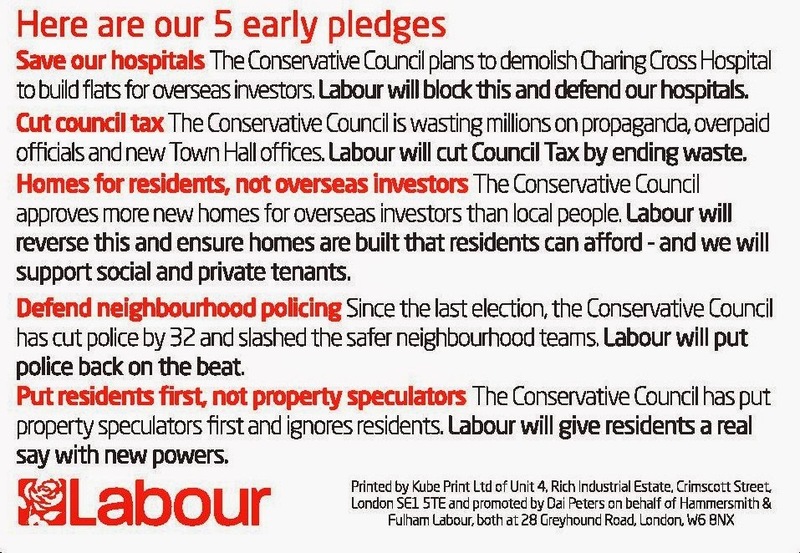 H&F Conservatives’ next tactic is not to talk about what they plan for Charing Cross Hospital at all. So, they have put out literature (which they have paid for this time) falsely telling people H&F Labour will put up council tax. They know that’s not true and have said as much to me privately. For the last year my colleagues and I have been publically campaigning to cut council tax, cut waste and tackle many of the Conservatives' £64.5 million of stealth taxes. We’ve said it on thousands of pledge cards and leaflets and here, here, here and many times more. They are failing to convince people of that too so are now saying H&F Labour supports the tube strikes. We do not. Indeed there is an RMT activist, presumably a strike organiser, helping H&F Conservatives' attempts to stay in power in this Borough by standing for election against us in a Labour ward. The Charing Cross Hospital demolition proposals have put lives at risk. If the A&E goes it will mean ambulances will be stuck in traffic to Paddington or Chelsea. Losing 450 acute care beds will mean the local NHS will not be able to cope. As The Independent reported, ”Hammersmith and Fulham council is the only council out of 11 in London affected by the hospital closures to have supported them". If elected in three week’s time, my Labour colleagues and I will cut council tax, cut £20 million of waste and modernise council services. We will give residents new powers to influence their neighbourhoods on planning and other matters and will ensure homes are built for residents and not overseas investors. 22nd May is Charing Cross Hospital Day. If residents use all 3 votes for Labour’s council candidates, then the very next day they too will have a Council committed to saving their hospital and defending the local NHS. Just like others across the country whose councils have already saved their local hospitals.